Get the best out of those monsters! Finish all the trials in the desert and the arctic land! Be fast and use the nitro boost to win the medals. Win a bronze medal at least to unlock next level. Collect certain medal sets to unlock new trucks. Make tricks to earn additional nitro charge. Download free full version game and win the gold medal! Free Game Features: - Real racing game; - Modern 3D graphics; - Extraordinarily addictive game play; - Gorgeous effects, huge explosions! - Original soundtrack and powerful sound effects; - Unique power-ups; - Free full version game without any limitations. 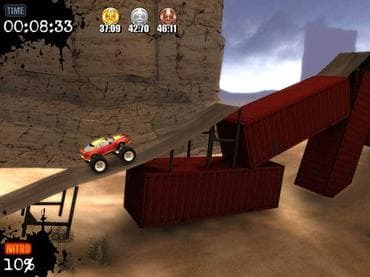 If you have questions about Monster Truck Challenge game, please contact us using this form.